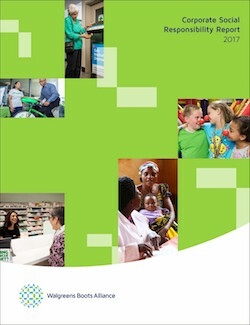 Walgreens Boots Alliance (Nasdaq:WBA) on Friday published its 2017 Corporate Social Responsibility (CSR) Report covering the company’s progress during the fiscal year ended 31 August 2017. The report shows how the company is setting the pace on sustainability issues from health care and combatting climate change to promoting diversity and fostering inclusion. Leveraging its scale and business values as well as the strong CSR heritage of its legacy companies, Walgreens Boots Alliance made significant strides during fiscal 2017, hitting important milestones and setting out new commitments within its 12 CSR goals. The company has also enhanced transparency regarding its impact on communities and the environment. In the report Walgreens Boots Alliance, formed in 2014, presents comparable data for its operations across the world for the first time, using fiscal 2016 data as a baseline. The data show the results of the company’s efforts to reduce emissions and waste, further diversity and inclusion and contribute to groups that work on addressing health care and other pressing global issues. Through its CSR strategy and goals, Walgreens Boots Alliance continues to support the United Nation’s 17 Sustainable Development Goals (SDGs). Walgreens Boots Alliance is committed to aligning its activities to support all 17 of the SDGs, which include goals to end poverty, take action on climate change, improve access to health and education, build strong institutions and more. Walgreens Boots Alliance will continue to report on its CSR achievements and progress on an annual basis. Additional information on the CSR report and the company is available at www.walgreensbootsalliance.com. Cautionary Note Regarding Forward-Looking Statements: All statements in this release that are not historical, including goals for and projections of future results, the expected execution and effect of our Corporate Social Responsibility strategies and initiatives and the amounts and timing of their expected impact, constitute forward-looking statements that are based on current societal, market, competitive and regulatory expectations. These forward-looking statements are not guarantees of future performance and are subject to risks, assumptions and uncertainties, known or unknown, including those described in Item 1A (Risk Factors) of the Company’s Annual Report on Form 10-K for the fiscal year ended 31 August 2017 and Quarterly Report on Form 10-Q for the fiscal quarter ended 30 November 2017, each of which is incorporated herein by reference, and in other documents that Walgreens Boots Alliance files or furnishes with the Securities and Exchange Commission. Should one or more of these risks or uncertainties materialize, or should underlying assumptions prove incorrect, actual results may vary materially. These statements speak only as of the date they are made and, except to the extent required by the law, Walgreens Boots Alliance does not undertake, and expressly disclaims, any duty or obligation to update publicly any forward-looking statement after the date of this release, whether as a result of new information, future events, changes in assumptions or otherwise. Walgreens Boots Alliance is the largest retail pharmacy, health and daily living destination across the U.S. and Europe. Walgreens Boots Alliance and the companies in which it has equity method investments together have a presence in more than 25* countries and employ more than 385,000* people. The Walgreens Boots Alliance, company is a global leader in pharmacy-led, health and wellbeing retail and, together with the companies in which it has equity method investments, has more than 13,200* stores in 11* countries as well as one of the largest global pharmaceutical wholesale and distribution networks, with more than 390* distribution centers delivering to more than 230,000** pharmacies, doctors, health centers and hospitals each year in more than 20* countries. In addition, Walgreens Boots Alliance is one of the world’s largest purchasers of prescription drugs and many other health and wellbeing products.